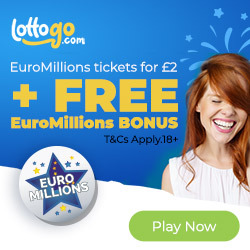 PlayLottery.com formally known as Big Fat Lotto are owned by Annexio Limited who are one of the biggest lotto providers in the UK. 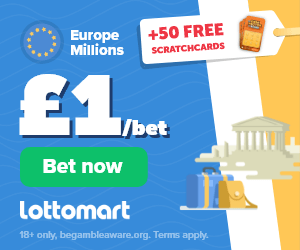 They are currently offering an introductory promotional offer of £1 for 81 EuroMillions and USA Powerball bets plus 15 free chances on the USA MegaMillions draw for all new players. By playing at this lottery site you substantially increase your chances of winning a prize as you are entered into each draw with other players in a syndicate. It’s a fact that 1 in 4 jackpots are won by syndicates. You can bet here on some of the world’s biggest lotto jackpots through the USA MegaMillions, Powerball, UK Lotto, EuroMillions and Irish Lotto. As well as syndicate bets there is also the option to buy single line lottery bets through your account area. By signing up as a new player today you will get 81 syndicate bets into the next EuroMillions and USA Powerball draws for paying just £1. 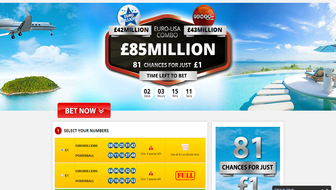 The EuroMillions has had top prizes at as much as £150 Million+. The USA Powerball has paid out the world’s biggest lottery jackpots of over $500 million! You can choose to have 15 syndicate bets for the next USA MegaMillions draw for the same price. You will also be entered into their prize draw to win a brand new iPhone 6. Once the promotional period has expired you can cancel or continue your subscription for £11.90 per week for 110 EuroMillions syndicated bets and £9 per week for 52 Powerball bets that’s a total of 162 chances per week on 2 draws per lottery giving you a great chance of winning! If you choose to continue your USA MegaMillions it is charged at £6 per week for 30 syndicated bets into each of the 2 weekly draws. You can change your subscription at any time by logging into your account. On each lottery you bet on it is with a different number of players and any prizes won are split equally. For the main UK lotto you get 110 chances per week and your winnings are split with 176 other players. On the EuroMillions you get 110 entries per week and split your winnings with 150 other people. More information on the odds and amounts of players in each syndicate can be found on their website. It is worth noting that although 150 or 176 people may sound like a lot because of the amount of entries you receive per draw you could easily win multiple times. All winnings are paid in UK pounds. You can see how much you have won at any time in your member’s area. You will also be notified via email. the (GBP) If you win any amount below £10 then it will be paid into your online account. You can use this money for your future subscriptions or you can wait until you have over £10 and cash out.